Matt, first love your blog. Not only only is it informative, but I enjoy your approach to it. Flippant is the best word I can think of. Everything you read about home brewing makes it seem like WAY to much work to ensure success, but your results prove otherwise. Two Hearted is also my favorite beer and I will be happy if I can replicate it well enough. I do have a couple of questions about the pot. Do you prefer it over the previous version? How do you determine how much water to add if there are no markings and you are using a hose? Does spigot placement matter? I was thinking of buying one of the dedicated pots with the spigot, markings, and thermometer. They are a little more expensive, but its ready to go and I think they are thicker. My hesitation is I believe the spigots are mounted lower than you recommend. You’re spot on, Trey. The spigots are way too low because they are meant for mashing or boiling, not for fermenting and kegging/bottling. They will be clogged with gunk. Otherwise, I would have bought one because they’re nice. With One Pot Brewing, the spigot should be about 2 inches from the bottom, depending on how fat the pot is, how big the batch. 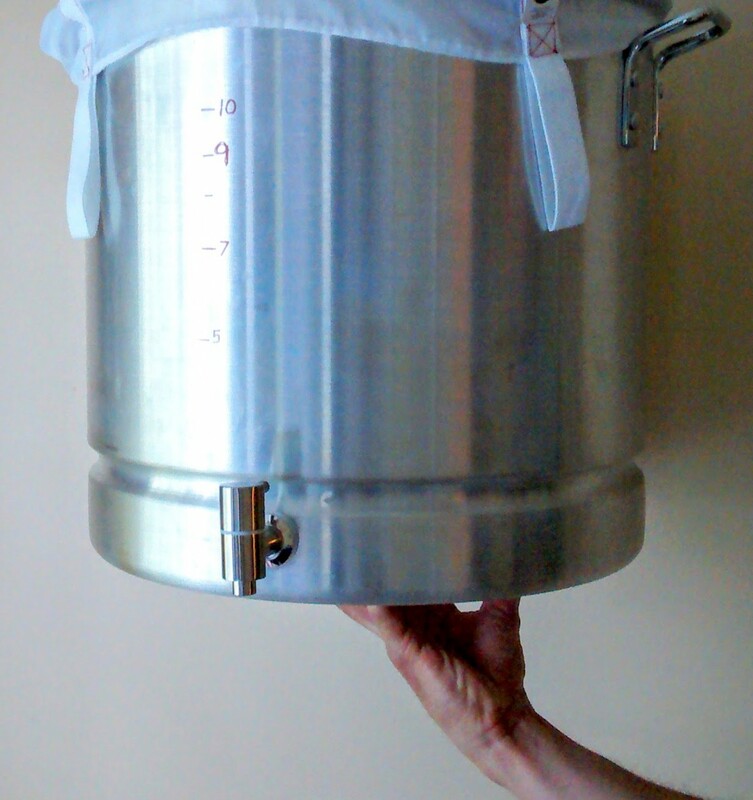 Remember: if the spigot is too high, no big deal – when bottling or kegging, simply tilt the pot towards you. Too low is not good. My new pot is much better, precisely because the spigot is placed correctly. I like the Stainless Steel better but I’m not sure why, I guess I like that it’s taller and thinner. I have markings on the outside of the pot, with permanent marker. They work fine. Thanks for the reply. Picked up a used fridge to ferment in and everything else should be here by the end of the week so hopefully I can brew my first batch Saturday. Really appreciate the info on here! Great site. I’m considering doing a similar process in a gigantic old aluminum pot I just acquired (like, 15 gallons or more). I’ve been working on my distilling process for a while now and to reduce the buckets I have to clean I’m thinking about just running my wort off directly into the pot, fermenting there, then doing my stripping run straight out of the aluminum pot. Just like the good ole times when they would make moonshine out in the woods! Couldn’t find any info on anyone else doing something similar except for your exploits discussed here. It seems lots of people get weird about aluminum for some reason. Doesn’t make sense to me because people have been cooking in it for over 100 years, putting fruits and other canned things in it since about the same time I think, and the best one – drinking beer out of cans made of aluminum all the dang time! Seems to be working out for us alright so far! Thanks for going against convention and trying new stuff. Keep up the good work! thanks Jake. People don’t use aluminum because they follow the crowd, and I’m not sure why people use so many vessels. I honestly think it’s a combination of (a) being fooled by companies to buy crap (b) group think (c) irrational fear of making bad beer (d) homebrewing tends to be a hobby for white people with money. I wound up here because of said Zymurgy article and man, I have a lot of catching up to do here. It NEVER would have occurred to me to use a single vessel for this, and since I’m starting from scratch after a year-long break from brewing, this is an especially intriguing idea. Thanks for writing the article, and I look forward to catching up on your posts here. that’s great to hear Brock, let me know how it turns out.